First, I would like to thank everyone who submitted photographs for this photo share theme: A Favorite Place You’ve Traveled. 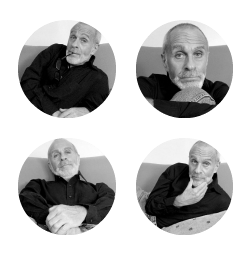 What I enjoy most about hosting these shares is when the photographs start coming into my email box and then click on the attachments to view them for the first time. Like a kid, I get all excited as if opening birthday presents, eagerly anticipating what’s inside! And as always, I oohed and aahed over the photos presented here. What I really love about these photographs is the diversity. And they are also places that I, personally, have never been. I was driving through Iowa, and saw on the map that Clear Lake was just a half-hour detour. I was familiar with the name, because - even though it was before my time - I knew that Buddy Holly, Ritchie Valens and the Big Bopper had died in a plane crash in a field outside of Clear Lake on a snowy February night in 1959. After visiting the Surf Ballroom, where the three performed earlier on that fateful evening, I located a map that showed me where the crash site was. I drove several miles down a rural farm road in the middle of nowhere without passing another human being, and then I stumbled upon this marker. Buddy Holly's signature glasses. I parked my car here and trekked about a mile down a desolate soybean field, finding the crash site nearly unmarked save for a simple plaque and a few offerings left by others. I reflected on the loneliness of the site, and how it hadn't changed a bit in 52 years. And there, I felt still the power of three men who changed the face of rock 'n roll music, and died much too early. One of the highlights of my trip, for sure. We run away to the tropics to escape the Midwest winters and usually end up in Cancun, Mexico. We’ve been there so many times, it feels like home away from home! We took our first grandchild there when she was 5 months old and will introduce our youngest to the Caribbean sand this winter at about a year old. It’s our favorite place because 1) we can get on a plane at 8am and be on the beach by noon! 2) the beaches are sugar soft and 3) the water is a wonderful shade of relaxation. This picture was taken in the Needles District of Canyonlands National Park in Utah. It was around 7 pm and we felt as though we were the only ones in the park! I will always remember how silent it was there. The 'needles' in the distance look like a city, don't they? You can also see the 'potholes' filled with rainwater in the foreground, that hold tiny ecosystems. You feel as though you are on another planet there! 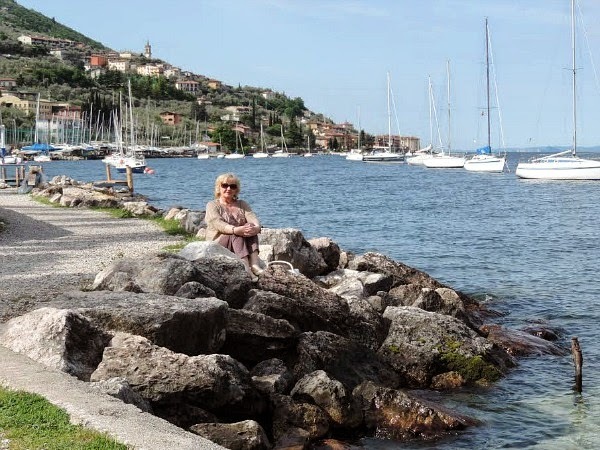 Assenza de Brenzone, Lake Garda, May 2014 - it just sums up the whole holiday. Have always wanted to visit Great Britain and did for a month in 1985. I so loved the people, especially the Scottish who are embracing, hospitable, and lovers of life, I decided to live there for an entire year. Lived in Edinburgh which is an architecturally and culturally magnificent city and from there visited the breadth of Scotland, much of England, Wales, and even Ireland. Scotland was one of the highlights of my life with a trunk full of colorful and magical memories. This photo was taken on the outer banks of Duck, North Carolina. It's a favorite place of mine to visit because it was the first time in my life I truly experienced a vacation, a life of leisure. We've been going almost yearly for the last 9-10 years and I never get tired of visiting. 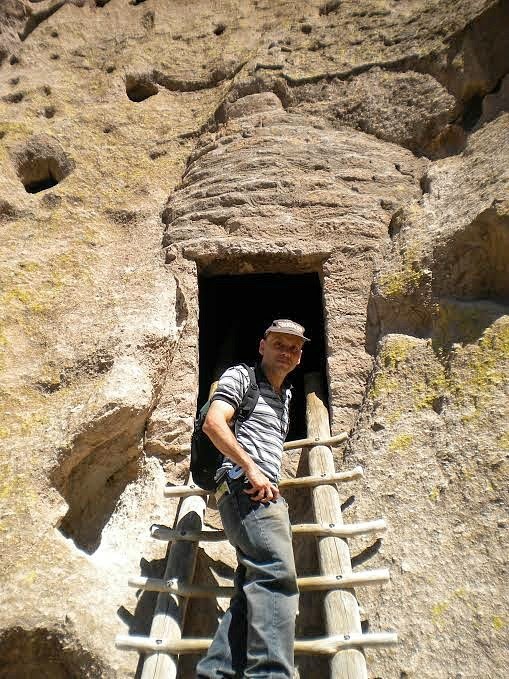 Me in 2009 visiting the cliff dwellings in New Mexico. I was staying with my cousin and her family in Santa Fe and this was one the first places I went to see. It was fun at first but as I climbed higher I was really wishing I had just taken pictures from terra firma. But I'm glad I made it to the top, where I learned climbing down was a hell of a lot scarier than climbing up. Again, thank you to everyone who shared photographs for this theme! I conclude this post with one of my favorite Frank Sinatra songs. I don't know why, but this song always gets me jazzed about traveling. I have it burned on a CD I listen to whenever I fly. I give you, Frank singing, "Come Fly With Me." Happy travels and have a super Monday everyone! Great photos! The colors in Valerie's picture is amazing! And how cool are those glasses in Mark's photo? I didn't remember the crash was in Iowa. It was a shame I couldn't take part in this exciting picture share, Ron. Never mind, there's always a next time. There are some cracking entries though, and I really like the unusualness of Rob's picture. Great photos everyone! And you're right, what a wonderful diversity. It was so interesting to read about Mark's experience at the crash sight in Iowa. The color in Valerie's photo is just beautiful! Loved the clip of Frank Sinatra. My mother adored him. "And how cool are those glasses in Mark's photo? I didn't remember the crash was in Iowa." I know, isn't that a cool photo? And I didn't remember that either so I found it fascinating to read Mark's narrative. Thanks so much for participating in this photo share. Love your photograph! "The 'needles' in the distance look like a city, don't they?" Yes, they do! In fact, when I first looked at the photo I thought it was a city. I've seen several photographs of Utah on a blog I read and it looks amazing! Thanks for sharing your gorgeous photos of your travels. I've vacationed in Duck and other OBX towns many times and prefer the beaches to ours...not as touristy as here. "Cannot wait to make the rounds, Ron!" Great! That's another reason why I love to share these kinds of post, so that everyone can meet each other through our blogs and connect. Much thanks for participating in this photo share. 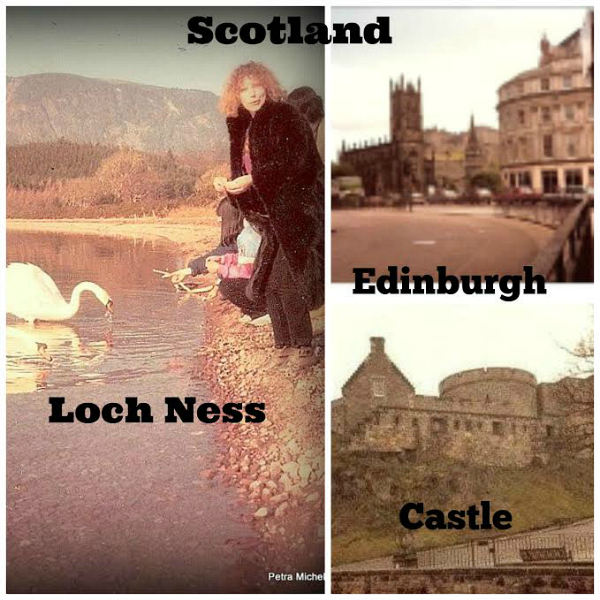 Your photograph and narrative makes me want to visit Scotland! "and I really like the unusualness of Rob's picture." Yes, isn't his picture FAB? I know so many people who RAVE about Arizona; not only about its beauty, but also because of the special energy that's there. I really need to visit one day. Thanks so much for stopping by, dear lady. Happy Monday and week! Hope all is well with Joe. I would love to visit Scotland as well. The only places I've visited in Europe were Amsterdam and Brussels, Belgium. Both were wonderful! Isn't the diversity in the photographs great? "It was so interesting to read about Mark's experience at the crash sight in Iowa." Yes, interesting indeed! I didn't remember about where the crash sight was. Valerie is a very gifted photographer who inspires me tremendously because she's a self-taught photographer. Please visit her website where you find many more great photographs. My father LOVED Frank Sinatra too! In fact, wherever I hear a song of his I think of my Dad. "Scotland looks like a wonderful place to visit." Yes, doesn't it? I've only been to two places in Europe (Amsterdam and Brussels Belgium). If I ever go back, I want to visit many other places because I adore Europe. Italy would be at the top of my list. "I've vacationed in Duck and other OBX towns many times and prefer the beaches to ours...not as touristy as here." I have only been to South Carolina and loved it. But judging from Valerie's photograph, I need to visit North Carolina because it looks stunning! Ron, your readers are soo much fun! Thank you for compiling this series of photos and descriptions -- I almost feel as though I got to take a vacation to those interesting places, too! 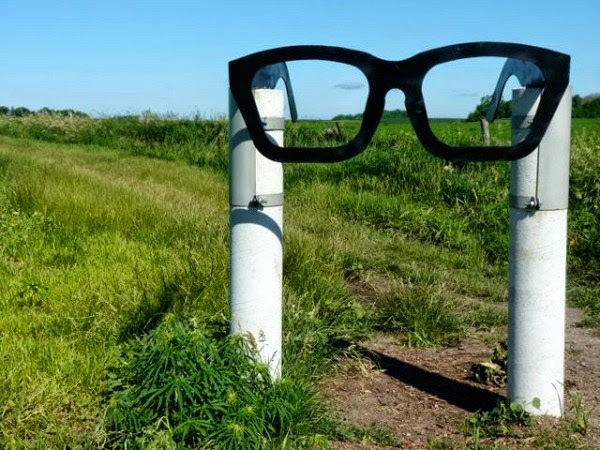 I hadn't realized Buddy Holly died in Iowa. How cool are those immense glasses! 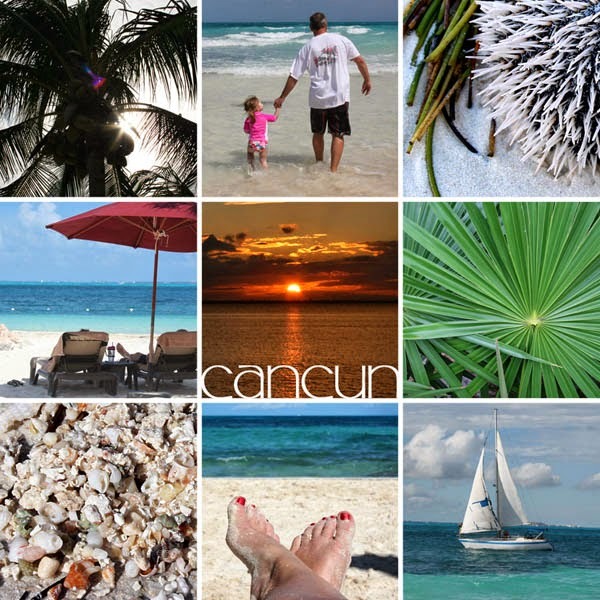 And I love Lisa's collage of Cancun, as well as Valerie's sunrise(?) pier. And how fortunate Petra is to have lived abroad for an entire year -- she's made me want to go back to Ireland that much more!! "Come Fly With Me" just happens to be my favorite Sinatra song. Why am I not surprised you picked that one to post? My dad is a huge fan and played his records all the time growing up. I know his music well! I love all these photos - great diversity here. The pier in Duck makes me want to visit! Gorgeous colors in that shot. They're ALL good. Thanks for giving us the opportunity to share! Way cool photograph of the glasses! Like Mark, Buddy Holly, Ritchie Valens and the Big Bopper were before my time, but I have always enjoyed the music of the fifties. Beautiful color in Valerie's photograph. And I love the one of Needles District of Canyonlands National Park in Utah. It does look like a city in the distance. Great photographs, everyone! And thank you for sharing, Ron. "I almost feel as though I got to take a vacation to those interesting places, too!" Me too because these are places I have never visited. "I hadn't realized Buddy Holly died in Iowa." Neither had I, so I found both the photograph and Mark's narrative utterly fascinating because I can only imagine what it must have been like to be there at the site of the crash.
" And how fortunate Petra is to have lived abroad for an entire year -- she's made me want to go back to Ireland that much more!!" I agree! I would so love to travel all over Europe for one year and visit certain places that I have always wanted to see. What an education that would be. ""Come Fly With Me" just happens to be my favorite Sinatra song. Why am I not surprised you picked that one to post?" HA! Mark, is that not one of the BEST Sinatra songs? My father was a HUGE fan of Sinatra and would play his records all the time as well. "I love all these photos - great diversity here." I agree, aren't they all FAB? And thanks so much for participating in this theme, buddy. I found your photograph and narrative utterly fascinating because I could only imagine what it must have felt like to have been there at the crash site. "Like Mark, Buddy Holly, Ritchie Valens and the Big Bopper were before my time, but I have always enjoyed the music of the fifties." It's funny because I grew up in the fifties but didn't really appreciate it until I got older and saw what a great decade it was - the music, the fashion, and the style. 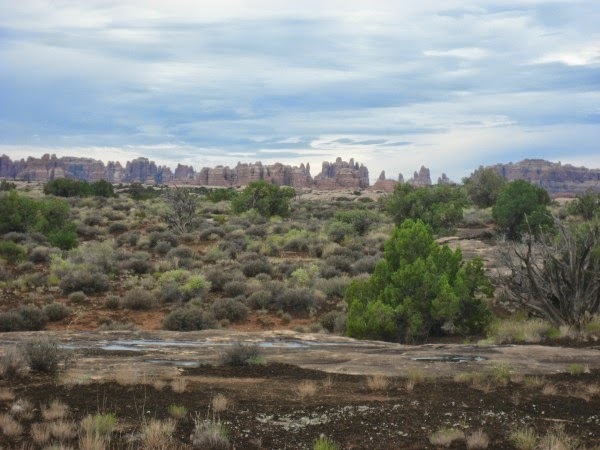 "And I love the one of Needles District of Canyonlands National Park in Utah. It does look like a city in the distance." It sure does! And I love the sky in that photograph. Awesome photos! And even though I haven't traveled much, I have been to Santa Fe, New Mexico so Rob's photograph reminded me of my visit. It's a beautiful place. I loved all the adobe homes and buildings. And after viewing Valerie's photograph of Duck, NC, I've got a sudden longing to visit. Beautiful! Nice. Looks like you really got about and about. You've been to Sante Fe, New Mexico? How faaabulous is that! One of my dear friends in Florida has a brother who lives there and she's visited him twice last year. She said the same thing, it's beautiful and that she adores the adobe style homes and buildings. She also said that the heat there is much easier to deal with because it's a dry heat, unlike Florida, which is sooooooo humid. 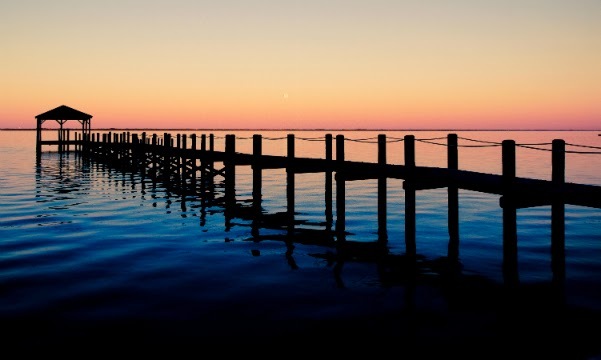 "And after viewing Valerie's photograph of Duck, NC, I've got a sudden longing to visit. Beautiful!" Thank you for stopping, Lady Lilith! What a great idea, Ron. If I had known about this and had been more of a sociable blogger (I've been spending my time on FB when online), I would have participated. In July, my husband and I stayed at a beautiful inn in the Catskills on Lake St. Joseph. Though all the pictures are wonderful, I absolutely love the picture of the outer back of Duck, NC. Hope you're having a great summer! Haha Mark's photo made me giggle! This was such a great thing to do Ronnie. This post makes me want to get out there and travel! Hey, Ron, thanks so much for including me in your photo share. I'm traveling right now so I hope to have more photos for your next photo post! Take care, buddy! nice set of photos ron and everyone who participated. 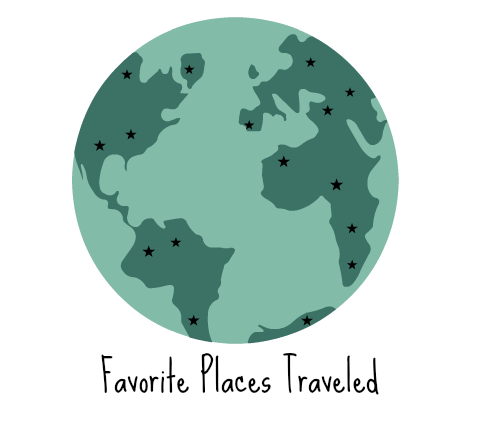 i enjoyed reading them and finding out the places people feel are special to them and why. i'll be in one of the places mentioned tomorrow. cancun. wooohoo! have a great week, ron. Yes, aren't they all faaaaaabulous? And thank YOU for submitting your beautiful photograph. I was a pleasure to include it! Have a lovely week, m'dear. And thank you for stopping by! It's so GREAT to see you! I post these photo shares several times a year, so perhaps you can participate in the next one because I would love include yours. "In July, my husband and I stayed at a beautiful inn in the Catskills on Lake St. Joseph." Oooo...that sounded faaaaaaabulous! Now that's my kind of summer vacation. Give me the mountains! Thanks so much for stopping by, my friend. Hope you're having a great summer too. I can hardly believe it's August already. The summer is flying by. Isn't Marks photo and story fascinating? He's a guy who loves to travel and travels a lot. He's very adventurous! Yaaaay, I'm so glad you stopped by to see your photo posted along with the others. It was a pleasure to share it! Hope you're having a SUPER time in Colorado. Can't wait to read and see all about it when you get back. Have a great time, buddy! Aren't the photos super? And thank YOU for submitting your stunning photograph. The color in that shot is amazing!
" i'll be in one of the places mentioned tomorrow. cancun. wooohoo!" Have a faaaaabulous time! And I know you'll be enjoying all that sunshine and warmth! See ya when you get back and have a safe journey! I regret taking part in this as well Ron...but I have had a couple of things going on in my personal life that I'm surprised I've had time to even keep up my own blog. I have been to some of the places that are pictured here...and love every single second of traveling. I really wish I could do more!! I hope all is well with you. I especially like that photo of the cliff dwellings in Santa Fe...I can close my eyes and remember the day I was there like it was yesterday! Hugs! True Ron, Santa Fe has more of a dry heat, yet the nights drop down to much cooler temps. Robert, it sounds a lot like when I was in Lake Tahoe, Nevada. Even during the summer the days were very warm, but at night the temperatures dropped down considerably. And I LOVED that. I hate forgetting things. I absolutely hate it. I shoulda wrote it on a bazillion stickey notes....NOT that my photo woulda surpassed these. Oh my gosh...you have some talented, well travelled folks that come here. And I squealed when I saw the first photo. I lived in that neck of the woods for a bit of time. "I hate forgetting things. I absolutely hate it. I shoulda wrote it on a bazillion stickey notes...."
That's why I left you a reminder on the comment I left on one of your blog posts last Friday. Maybe you didn't see it? Anyway, no worries, dear lady because I will be hosting more of these posts in the future, so you can participate then. Yes, aren't everyone's photos faaaaaaabulous? "And I squealed when I saw the first photo. I lived in that neck of the woods for a bit of time." HA! I KNEW you would when you saw that Mark had taken that photo in IOWA, your neck of the woods! Thanks so much for stopping by, Mel. Have a grrrrrrreat rest of your week! Some great photos here. I'm sorry I didn't submit anything, but I am actually on holiday at the moment, so maybe next time I'll share something from this trip. I will be sharing more of these posts in the future, so yes, next time! Hope you're having a super time on your holiday and thanks for stopping by! Hey there Katherine! And no, not at all. In fact, in encourage my readers to interact and speak directly to each other; especially when I share a post such as this. So thank you for speaking up. Valerie is on vacation right now (in Cancun) so I'm sure she'll read your comment when she returns. Thanks so much for stopping by girl! Hope your week is going faaaaabulously! It's so good to see you. I'm slowly slipping out of isolation. I like vacations that involve a short road trip. Vacations involving air travel create stress when you're supposed to be enjoying the afterglow. "I like vacations that involve a short road trip. Vacations involving air travel create stress when you're supposed to be enjoying the afterglow." I'm like you, I can take day trips and still feel as though I traveled. And I agree, the whole deal with flying has become such a hassle and stress. I miss the good ol' days when flying felt like a luxurious and enjoyable experience. Fly Me to the Moon is my favorite! Also someplace I'd like to travel if it were a little more hospitable! Loved the pics! "Fly Me to the Moon is my favorite!" OMG yes....another GREAT Sinatra tune! Love posts like this!! Sorry I'm getting around so late and can't participate but I surely enjoyed reading of others' travels. Of those listed, I've only driven thru North Carolina, stayed overnight off the main road of our route so didn't see much. And, as you know, Cancun was a wonderful trip for us. I often think, when I watch shows like 'House Hunters International', that it would be so cool to have a decent amount of money and then just go spend a few months at a time in different places around the world. Three months in Italy, 2 in Switzerland, a few weeks in the Canyon area of the States, etc. etc. No worries, Mary :) I post these photo shares several times a year, so perhaps you can participate in the next one. ". And, as you know, Cancun was a wonderful trip for us." Yes! And I so thought of you when Lisa submitted her collage of Cancun because I know how much you and Ron enjoyed yourselves there. "Three months in Italy, 2 in Switzerland, a few weeks in the Canyon area of the States, etc. etc." Meeeeeee too! Italy and Switzerland are two places on my list of European countries. The Canyon as well! Much thanks for stopping by, neighbor! Have a great rest of your week!